For centuries, dance manuals and other writings have lauded the health benefits of dancing, usually as physical exercise. More recently we’ve seen research on further health benefits of dancing, such as stress reduction and increased serotonin level, with its sense of well-being. Most recently we’ve heard of another benefit: Frequent dancing apparently makes us smarter. A major study added to the growing evidence that stimulating one’s mind by dancing can ward off Alzheimer’s disease and other dementia, much as physical exercise can keep the body fit. Dancing also increases cognitive acuity at all ages. The 21-year study of senior citizens, 75 and older, was led by the Albert Einstein College of Medicine in New York City, funded by the National Institute on Aging, and published in the New England Journal of Medicine. Their method for objectively measuring mental acuity in aging was to monitor rates of dementia, including Alzheimer’s disease. In this study, neurologist Dr. Robert Katzman proposed these persons are more resistant to the effects of dementia as a result of having greater cognitive reserve and increased complexity of neuronal synapses. Like education, participation in mentally engaging activities lowers the risk of dementia by improving these neural qualities. Our brain constantly rewires its neural pathways, as needed. If it doesn’t need to, then it won’t. When brain cells die and synapses weaken with aging, our nouns go first, like names of people, because there’s only one neural pathway connecting to that stored information. If the single neural connection to that name fades, we lose access to it. As people age, some of them learn to parallel process, to come up with synonyms to go around these roadblocks. The key here is Dr. Katzman’s emphasis on the complexity of our neuronal synapses. More is better. Do whatever you can to create new neural paths. The opposite of this is taking the same old well-worn path over and over again, with habitual patterns of thinking and living. The focus of that aphorism was creative thinking, to find as many alternative paths as possible to a creative solution. But as we age, parallel processing becomes more critical. Now it’s no longer a matter of style, it’s a matter of survival — getting across the creek at all. Randomly dying brain cells are like stepping stones being removed one by one. Those who had only one well-worn path of stones are completely blocked when some are removed. But those who spent their lives trying different mental routes each time, creating a myriad of possible paths, still have several paths left. What exactly do we mean by “intelligence”? You’ll probably agree that intelligence isn’t just a numerical measurement, with a number of 100 plus or minus assigned to it. But what is it? To answer this question, we go back to the most elemental questions possible. Why do animals have a brain? To survive? No, plants don’t have a brain and they survive. To live longer? No, many trees outlive us. Semantics will differ for each of us, but according to many, if the stimulus-response relationship of a situation is automatic, we don’t think of the response as requiring our intelligence. We don’t use the word “intelligent” to describe a banana slug, even though it has a rudimentary brain. But when the brain evaluates several viable responses and chooses one (a real choice, not just following habits), the cognitive process is considered to be intelligent. As Jean Piaget put it, intelligence is what we use when we don’t already know what to do. That’s where this particular study falls short. It doesn’t answer these questions as a stand-alone study. Fortunately, it isn’t a stand-alone study. It’s one of many studies, over decades, which have shown that we increase our mental capacity by exercising our cognitive processes. Intelligence: Use it or lose it. And it’s the other studies which fill in the gaps in this one. Looking at all of these studies together lets us understand the bigger picture. One way to do that is to learn something new. Not just dancing, but anything new. Don’t worry about the probability that you’ll never use it in the future. Take a class to challenge your mind. It will stimulate the connectivity of your brain by generating the need for new pathways. Difficult classes are better for you, as they will create a greater need for new neural pathways. Do all kinds of dancing lead to increased mental acuity? No, not all forms of dancing will produce the same benefit, especially if they only work on style, or merely retrace the same memorized paths. Making as many split-second decisions as possible is the key to maintaining our cognitive abilities. Remember: intelligence is what we use when we don’t already know what to do. We wish that 25 years ago the Albert Einstein College of Medicine thought of doing side-by-side comparisons of different kinds of dancing, to find out which was better. But we can figure it out by looking at who they studied: senior citizens 75 and older, beginning in 1980. 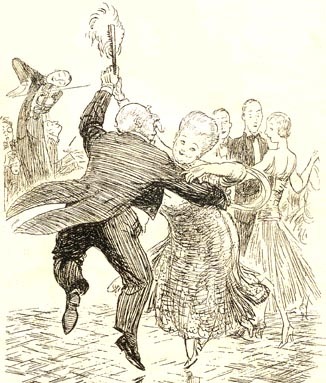 Those who danced in that particular population were former Roaring Twenties dancers (back in 1980) and then former Swing Era dancers (today), so the kind of dancing most of them continued to do in retirement was what they began when they were young: freestyle social dancing — basic foxtrot, swing, waltz and maybe some Latin. I’ve been watching senior citizens dance all of my life, from my parents (who met at a Tommy Dorsey dance), to retirement communities, to the Roseland Ballroom in New York. I almost never see memorized sequences or patterns on the dance floor. I mostly see easygoing, fairly simple social dancing — freestyle lead and follow. But freestyle social dancing isn’t that simple! It requires a lot of split-second decision-making, in both the Lead and Follow roles. At this point, I want to clarify that I’m not demonizing memorized sequence dancing or style-focused pattern-based ballroom dancing. I sometimes enjoy sequence dances myself, and there are stress-reduction benefits of any kind of dancing, cardiovascular benefits of physical exercise, and even further benefits of feeling connected to a community of dancers. So all dancing is good. In social dancing, the Follow role automatically gains a benefit, by making hundreds of split-second decisions as to what to do next, sometimes unconsciously so. As I mentioned on this page, women don’t “follow”, they interpret the signals their partners are giving them, and this requires intelligence and decision-making, which is active, not passive. 1) Really pay attention to your partner and what works best for her. Notice what is comfortable for her, where she is already going, which signals are successful with her and which aren’t, and constantly adapt your dancing to these observations. That’s rapid-fire split-second decision making. 2) Don’t lead the same old patterns the same way each time. Challenge yourself to try new things. Make more decisions more often. Intelligence: use it or lose it. The huge side-benefit is that your partners will have much more fun dancing with you when you are attentive to their dancing and constantly adjusting for their comfort and continuity of motion. And as a result, you’ll have more fun too. That’s the most succinct definition I know for intelligent dancing: a highly active attention to possibilities. And I think it’s wonderful that both the Lead and Follow role share that same ideal. The best Leads appreciate the many options that the Follow must consider every second, and respect and appreciate the Follow’s input into the collaboration of partner dancing. The Follow is finely attuned to the here-and-now in relaxed responsiveness, and so is the Lead. The study made another important suggestion: do it often. Seniors who did crossword puzzles four days a week had a measurably lower risk of dementia than those who did the puzzles once a week. If you can’t take classes or go out dancing four times a week, then dance as much as you can. More is better. And do it now, the sooner the better. It’s essential to start building your cognitive reserve now. Some day you’ll need as many of those stepping stones across the creek as possible. Don’t wait — start building them now.